How much should you have to pay to do what you want to do? FLORENCIO ORTIZ HAS ALWAYS HAD A TALENT for drawing. When he graduated from Alhambra High, in Southern California, he thought he might want to be an animator in Hollywood. So he followed the billboards and TV ads to a place called the Art Institute of Santa Monica, later to be renamed the Art Institute of California—Los Angeles, subsidiary of the Art Institutes International, LLC (“America’s Leader in Creative Education”), a division of Education Management Corporation (NASDAQ: EDMC). 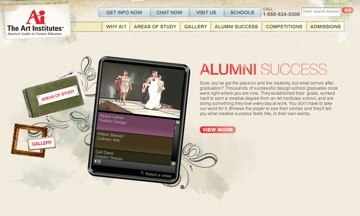 With more than 40 “education institutions” across North America, the Art Institutes — like the University of Phoenix, the ITT Technical Institute, and many others of similar ilk — offer students from all educational and socioeconomic backgrounds, from all over the world, a variety of fast-track degree programs in the sexiest of fields: Advertising, Animation & Special Effects, Video Production, Culinary Arts, Photography, and the like. It doesn’t matter how you did (or didn’t do) in high school, or how you scored on some bogus standardized test. Or if you went to high school at all. It doesn’t matter that you’re currently working 40 hours a week in front of the microwave at Quesadillas-R-Us, making $8 hour without benefits just to cover your rent and bus pass, and maybe to help chip away at the hospital bills for your mother’s operation last year — to say nothing of health insurance premiums or… college tuition. In fact, this is about breaking that cycle. This is about getting hands-on, practical experience in what YOU want to do. This is about setting off as quickly and painlessly as possible toward the bright future that awaits, toward “the very real possibilities these programs can open up for you.” This is about breaking free. “We want to make the application process as easy as possible,” they say. And they mean it. (The primary motivation of the “Admissions Representative” — and if you drop in for a visit you’re sure to see more of these than teachers — is to get as many students as possible through the door.) So hey, click here, and get started! In 2006, Education Management Corporation, then “the nation’s second-largest commercial school and education company,” sold itself to Goldman Sachs and Providence Equity for $3.4 billion. Since then, a lucky combination of recession, rising unemployment, massive funding cuts in public post-secondary education, and the inexorable force of the internet, have meant boom-times in the for-profit education sector. The whole scheme may have taken a slight hit with some recent critical exposure in the New York Times, and a hard-hitting exposé entitled College, Inc., on PBS Frontline. But the phenomenon of for-profit education, as an alternative to the clunk and inefficiency (and fundamental elitism) of traditional colleges and universities, isn’t likely to go away anytime soon. As much as I hate to say it, having myself come up half-formed from that ancient world (and even done time in front of the classroom, both at a traditional public university and at the very same Art Institute), the case for all those books and vine-choked buildings and chalkboards and tenured professors is getting thinner by the fiscal quarter. 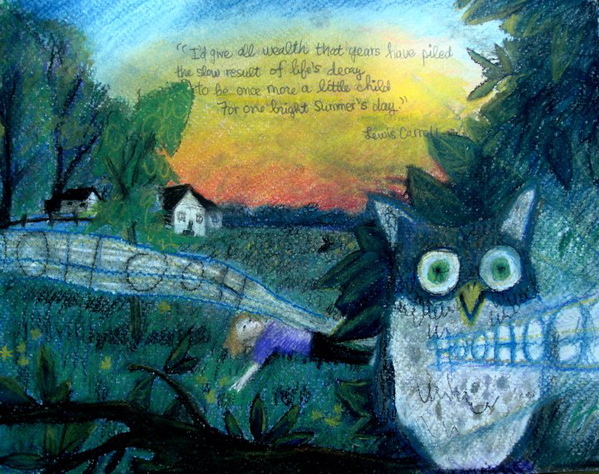 It must be said: there are serious educators working within the for-profit system — dedicated, talented mavericks — who’ve been able to use the relative lack of administrative oversight and minimum standards to forge exciting new models in pedagogy, to push the limits of the classroom in ways that wouldn’t be possible at more traditional, state-sponsored institutions — to get some real teaching done. And from the inexhaustible river of student/clients passing through there are success stories. You can read about them here. But there are also those — a good majority, I would wager — who might’ve been better served putting down a credit card against a decent set of watercolors, a wide-brimmed hat, a dictionary, and a round-the-world ticket. By the time Florencio finished at the Art Institute, with an Associate’s Degree and three years of non-transferable course credits, he’d racked up $40,000 in student loan debt. Now he works as a maintenance technician at Dreyer’s Ice Cream in Bakersfield. He doesn’t draw much anymore. Oh, and he’s studying physics at Cal State. So you wanna travel the world and get paid for it? Seriously? Join the military. Otherwise, well, your best bet is probably not to pile on twenty to forty grand a year in federally subsidized loans in exchange for a certificate from some shady corporation, which document, frankly, no one — except perhaps your mother — is going to look at. In all gold rushes there are the lucky few sonsabitches who find enough glitter they can break free from the shovel — forever. But most of the real fortunes go to those who sell shovels (and beer and newspapers and transportation and durable canvas outerwear). Which isn’t to say we couldn’t all use some education. Or that we might not have to shell out for some tools along the way. You’ll just want to be sure you get gear (and beta) that’ll hold up over time, at a reasonable price. Like, for starters: a cheap notebook, a motel pen, a good pair of shoes, and a library card. If you think you’re ready to commit and do the hard work, a few hundred bucks for a well-chosen mediabistro course or a good lap around MatadorU (with its promise of hard-fought tips, some real-world pro editing of your stuff, and a place to publish it too) seems a fair bargain. Or at the very least a good cheap way to test your resolve. But if anybody ever tells you it’s gonna be easy, be sure you know what they’re selling you — and how much it costs.